For Home or Commercial Use.. We will help design the ADA Compliant ramp system to meet your home or business needs! Call our Modular Ramp Specialists today. We will be happy to assist in a layout design and pricing to meet ADA standards and make your home or business accessible! LOWEST PRICES ON THE NET!!! Open: 9AM to 9PM EST. Mon-Sat. We at American Wheelchairs have pulled out all the stops to provide you with the most in-depth information needed to assist you in configuring your modular ramp system. Let us help you meet ADA required standards to avoid hefty fines or lawsuits for your home or business location. 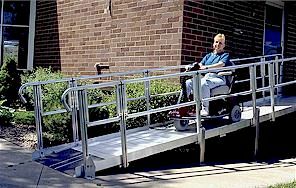 The components of this ramp are ADA approved and all aluminum and can be designed in many formats to fit any home or commercial access needs. The 36" wide ramp system has a load carrying capacity of 100 lbs. per square foot. 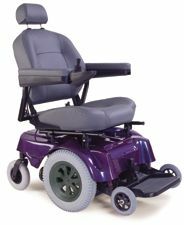 The ramp system consists of standard components that can be assembled quickly and easily with common hand tools. The modular components make it easy to move the ramp to a new location or change the configuration. Straight ramps, 90 degree turns, and 180 degree switchbacks are designed to meet ADA recommendations. Standard hand rails consist of two 1 1/2 inch diameter horizontal rails. Optional handrail designs and looped grab bar ends are available. Custom size ramps are available upon request. Our modular ramps are portable, durable and affordable and can be designed to fit most any configuration. Landscaping can be used to compliment any modular ramp to offer style in appearance as well as functional access to many areas. Let us help you design the ramp you need to access your home or business!